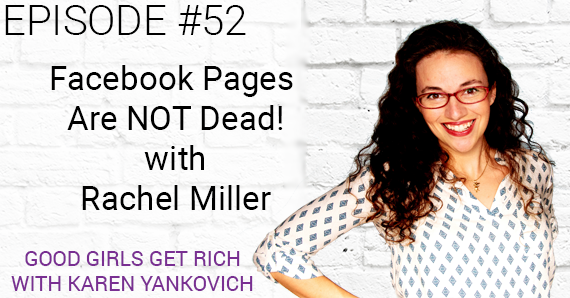 This week, Good Girls Get Rich features, guest, Rachel Miller. Rachel Miller is a Lifetime Learner. Giver of hugs and kisses. Mom to a vanful. Online entrepreneur. She has built several multiple 6-figure and 7-figure businesses, authored multiple books, one of which sold more than 100,000 copies. She now helps other businesses grow engagement for their brands – she has helped 34 people get their content in front of more than 10,000,000 people. Where do you start? Figure out exactly what your niche is and who are you targeting in that niche? What does that person say about themselves? What an inspiring conversation! Thank you, Karen, for sharing wonderful Rachel with us!